Philadelphia was the perfect place to hold the DNC Convention because it is nicknamed the Cradle of Liberty. This is the location where the Declaration of Independence and the U.S. Constitution were signed, forming the modern United States. 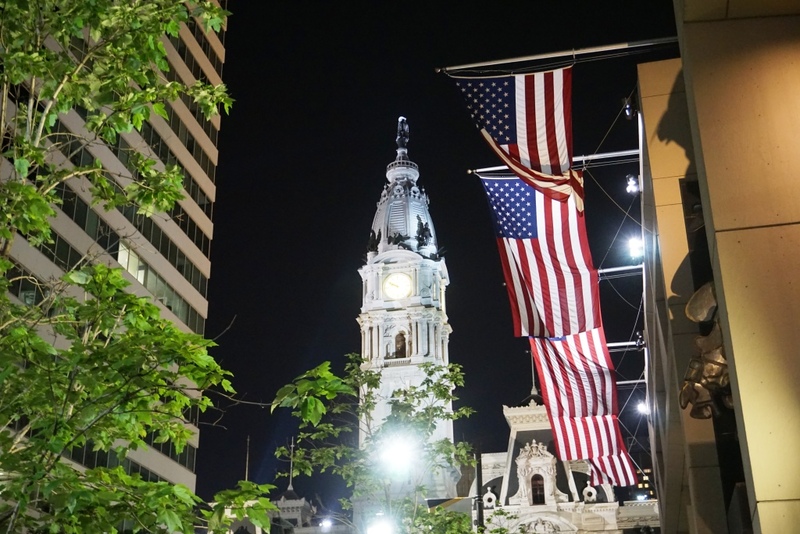 Following are 10 patriotic things to do in Philadelphia. 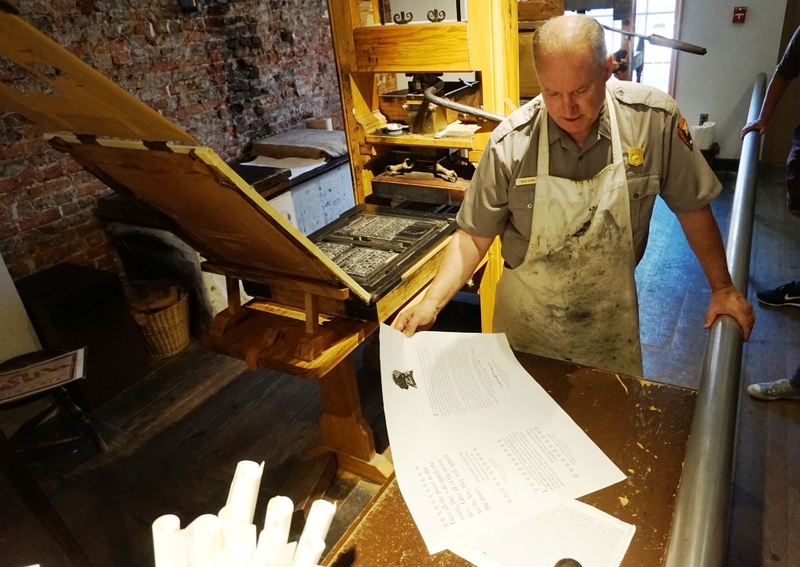 A National Park Service Ranger Gives a Printing Demonstration at the Franklin Court Printing Office in Philadelphia. Look for yellow, oval signs reading “Once Upon a Nation“ and a bench to learn about history as told by engaging historic storytellers. Historic Philadelphia, Inc., an organization dedicated to sharing Philadelphia’s place in U.S. history, coordinates the program called Once Upon a Nation. The Storytelling Benches are located throughout Historic Philadelphia. Stories are free. Take a Tour with Context to Learn More About American History in Philadelphia. Context offers thematic tours led by Ph.D. and master’s level scholars and group size is limited to six people. A patriotic thing to do in Philadelphia is the Franklin Seminar to learn about Benjamin Franklin from his early beginning to his death. 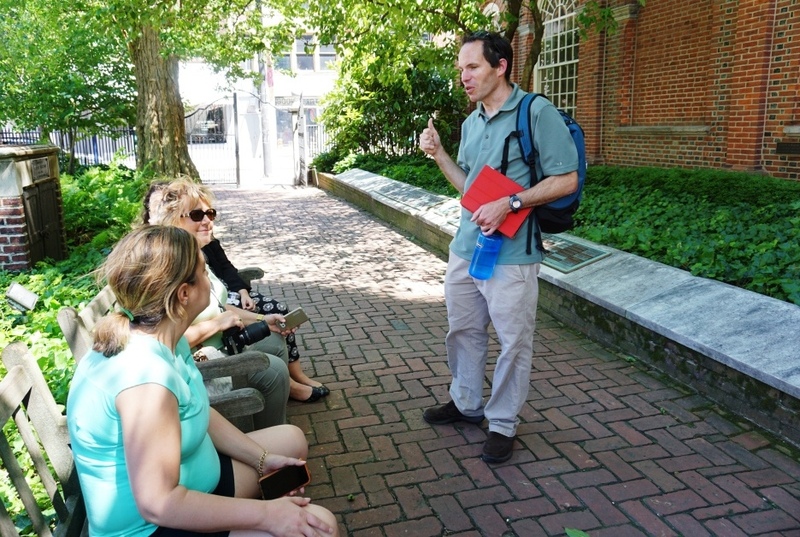 The walking tour visits Historic Philly including Christ Church (where I sat in Franklin’s pew), Franklin Court, and Second Bank U.S. Portrait Gallery. Election season is in full swing and let’s get real, the mud-slinging is in full swing and love trumps hate. 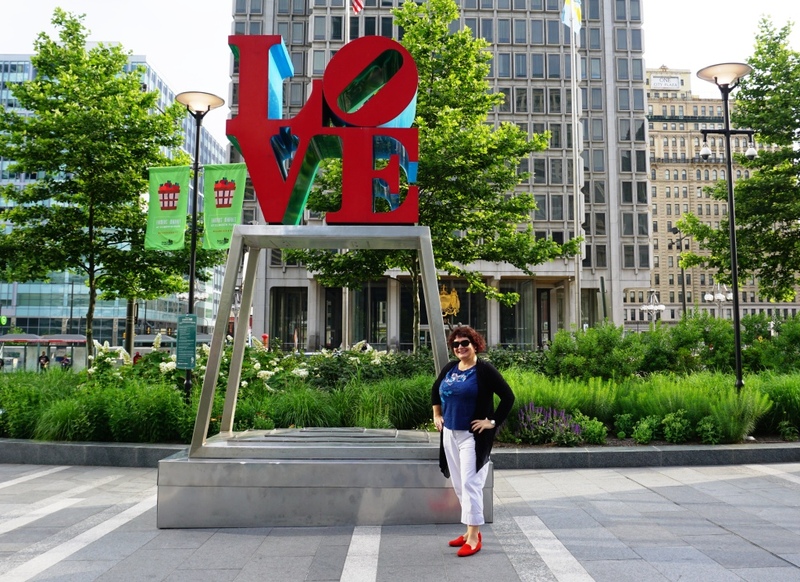 Head to Dilworth Park to see and snap a selfie of the famous LOVE sculpture by American artist Robert Indiana. 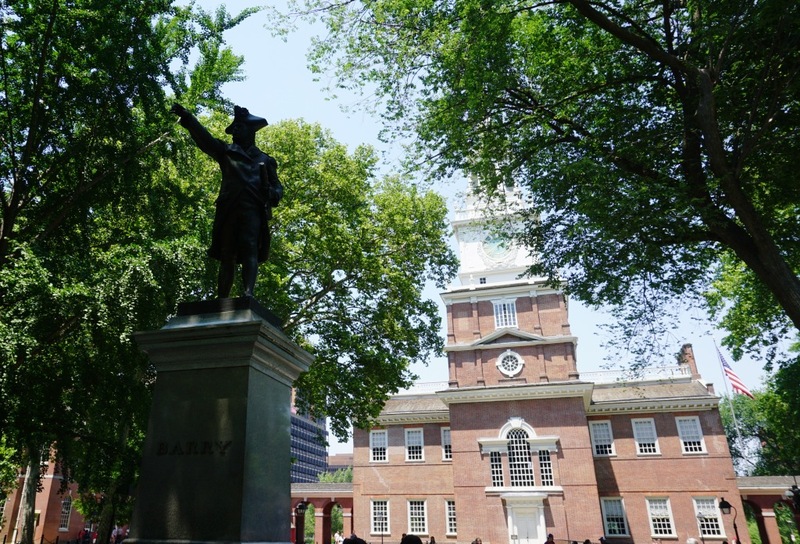 City tour company Urban Adventures has created two patriotic tours relating to the DNC Convention, “I’m with Her: Hillary Clinton and Philly’s Founding Women” and “Feel the Bern: Bernie Sanders and Philly’s Revolutionaries” pretty patriotic. The first is about Philadelphia’s prominent women and their role in founding the U.S. and the second emphasizes Philadelphia’s working class history and more. 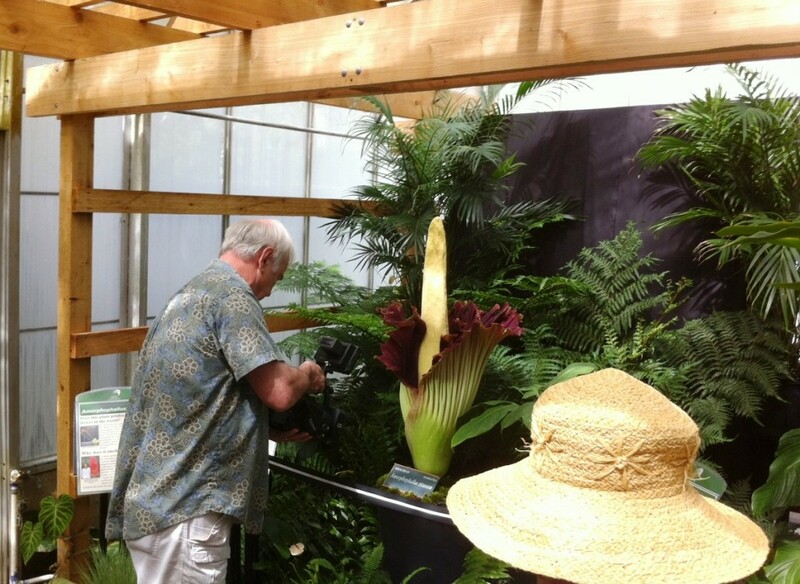 Don’t worry, these tours promise to keep political agendas out of the agenda. 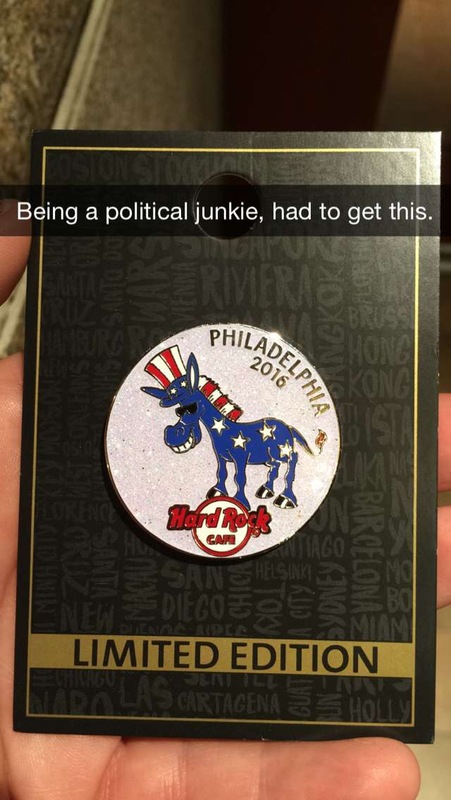 During the DNC Convention in Philadelphia, It Should Be Easy to Find Political Pins, Buttons and Other Souvenirs. No doubt, it will be easy to collect patriotic souvenirs during the DNC Convention in Philadelphia but a few places I found fun stuff included Philadelphia International Airport gift shops, Hard Rock Café (picked up a cool DNC pin, pictured) and One Liberty Observation Deck Gift Shop, for a Ben Franklin bottle opener, which, I’m sure he would appreciate, since he was a fan of beer. 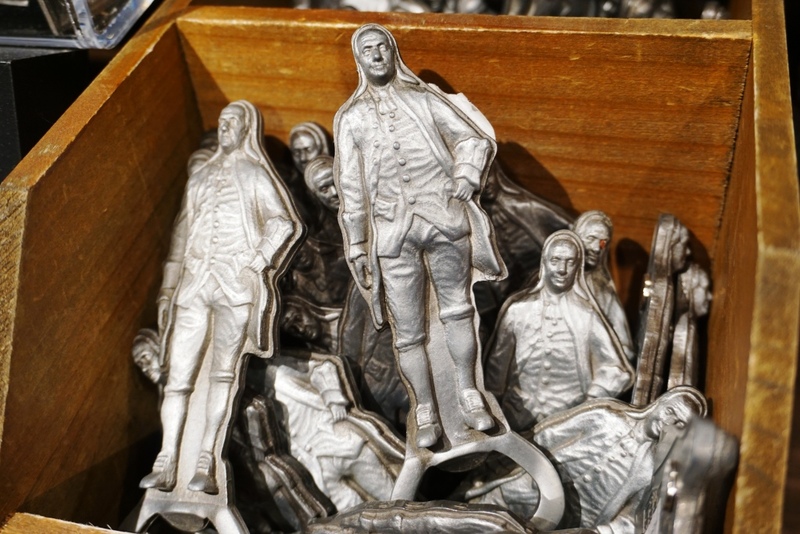 Benjamin Franklin Bottle Openers at One Liberty Observation Deck. Planning on attending a political rally? My tips on attending a presidential rally is a great starting point to prepare.